Greenville’s Abbie Yoder (23) and Josi Worden (18) go up for a block attempt during a match with Trotwood-Madison on Tuesday night in the GHS gymnasium. The Lady Wave won the match in three sets for their third straight victory. Greenville’s Emma Klosterman (1) gets a tip over the net for a point during a match with Trotwood-Madison on Tuesday night in the GHS gymnasium. 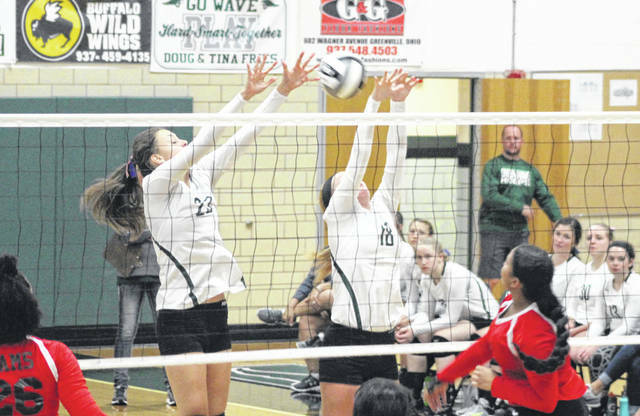 The Lady Wave won the match in three sets for their third straight victory. Greenville’s Emma Klosterman (1) goes for a kill during a match with Trotwood-Madison on Tuesday night in the GHS gymnasium. The Lady Wave won the match in three sets for their third straight victory. Greenville’s Madilyn Francis (26) and Abbie Yoder (23) go up high for a block at the net during a match with Trotwood-Madison on Tuesday night in the GHS gymnasium. The Lady Wave won the match in three sets for their third straight victory. GREENVILLE – The Greenville girls volleyball team is starting to come together. 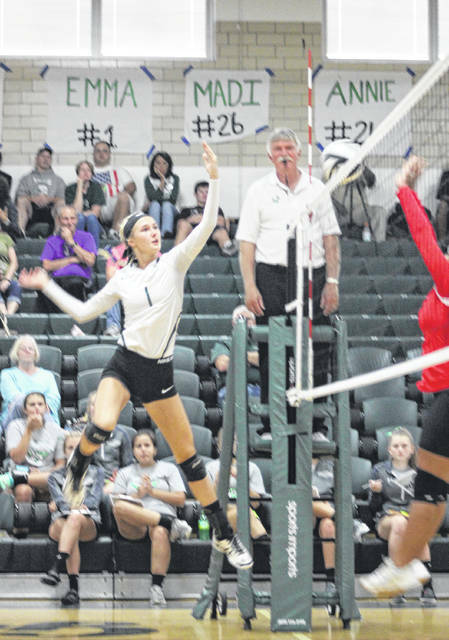 Since starting the season 1-5, the Lady Wave have won three straight matches including a three-game sweep of visiting Trotwood-Madison on Tuesday night. 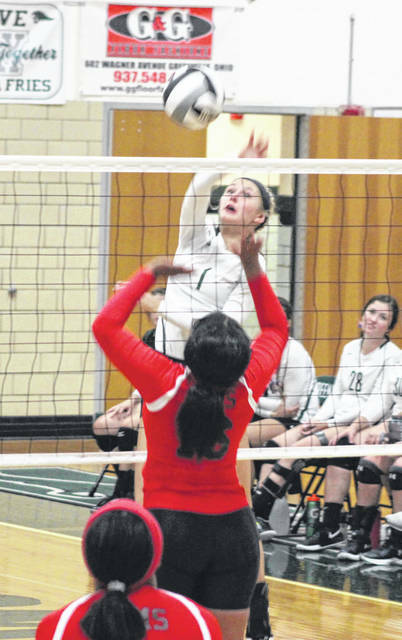 Greenville handled the Rams with relative ease 25-8, 25-5, 25-13 to ups its record to 4-5. 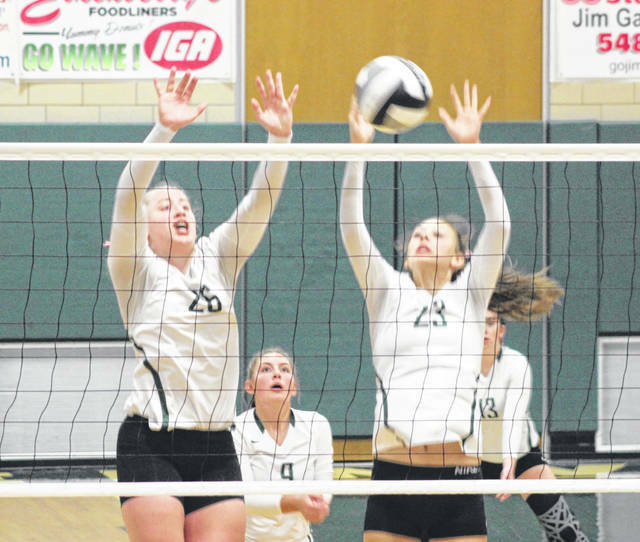 “Coming into the season we really didn’t know what our competition would be like other than what the girls told and what we heard from other sources,” said first-year GHS coach Michelle Hardesty. “We kind of expected to win so absolutely we are pleased with the win tonight. The first game started off with Trotwood taking the early 3-0 lead, but the Lady Wave finally got rolling with eight straight points for an 8-3 lead. Greenville never really looked back from there although the Rams did get as close as 8-6 before GHS pulled away to win the first set 25-8. In the second set, Greenville romped to a quick 4-0 lead and never trailed in this one winning handily 25-5. Koryann Elliott and Madilyn Francis had a couple of kills each to lead the charge in the second game. The third and final set ended with Trotwood scoring its most points of the night at 13, but Greenville was still control throughout after breaking a 5-5 tie with the Rams. Sophomore Jaden Cress had an ace serve to make it 8-5 in favor of Greenville and the Lady Wave stretched that lead to 21-8 to essentially put the game and match on ice. Statistically speaking, no one player dominated for Greenville. As a team, the Lady Wave collected 36 kills and had 23 aces on 73 serve attempts. Shelby Herman and Worden each had six aces to lead the team, while Elliott, Chloe Cox, Libby McKinney and Mariah Nicholas had two aces apiece. Francis, Cress and Brooke Stachler each had one ace. When on the attack, Elliott, Worden, Francis, Abbie Yoder, Annie Hayes and Emma Klosterman had four kills each with Stachler leading the way with 13 assists. McKinney had 8 assists. “Our confidence is building, absolutely,” Hardesty said. “Confidence and great leadership. I think when you play together as a team you’re building confidence. Just winning builds confidence. You can see it in practices and you see it during their play. They want to be pushed and they accept whatever Jim or I tell them to do. They just go out and do it. This entry was tagged Abbie Yoder, Emma Klosterman, Greenville volleyball, GWOC, Lady Wave, Madilyn Francis, Michelle Hardesty. Bookmark the permalink.